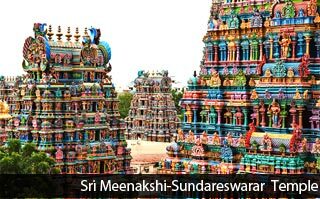 Once upon a time, Madurai was the temple town steeped in the cultural and spiritual heritage bestowed on the region by the Goddess Meenakshi and Lord Sundareshwar. And now also, the city continues to be thriving on the same spiritual heritage. The ancient legacy of this town is still intact where visitors can still feel overshadowed by the magnificent architecture and splendour of the temple's thousand pillar courtyard, water tanks and iconic colourwashed gopurams. Epitomizing the sacred confluence of religion and culture, Madurai is the oldest continuing city of the southern peninsular India and also is one of the timeless cities worldwide. Established around the legendary landmark of Meenakshi Temple, Madurai rich cultural past also belongs to the Sangam period (the Tamil scholars' conglomeration) which existed for more than 100 years. Also, Madurai was the backdrop of Mahatma Gandhi. The legendary foundations of Sri Madurai Sundareswarar Temple comprise the oldest continuing legacy of Madurai which is a spectacular representation of Dravidian architecture. The intricately carved gopurams or temple towers of this medieval era temple stand out. Inside the temple, tourists will definitely be amazed with the expansive stone shops and pet elephants showering blessing on the visitors. The thousand pillared hall, the Nataraja idol and other brass images exhibit the grandeur of the temple. It is housed in a 300-year-old palace dedicated to Mahatma Gandhi and contains paintings, sculptures, a section on Khadi and Village Industries and South Indian handicrafts. Timings: 1000 hrs to 1300 hrs & 1400 hrs to 1700 hrs. Open on all days. 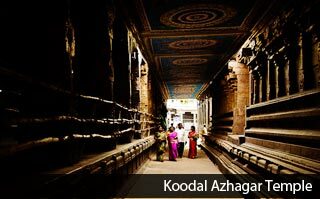 Towards the west of the city is the ancient Vaishnavite temple, Koodal Azhagar Temple, known for its beautiful sculptures. Here, Lord Vishnu is depicted and worshipped in three poses; sitting, standing and reclining one above the other. This is a tank located 2km close to Meenakshi Amman Temple. Literally, the pond or Teppakullam is used only for devotional festivals in this sacred city. The tank is fed by Vaigai’s river through an ingenious network of underground channels. The reminiscent palace of Nayak Dynasty, Thirumalai Nayak Palace was built in 1636 by the ruler of Madurai, King Tirumalai Nayak. The lavish building seen today is based on Indo Sarcenic architectural blend featuring domes, impressive arches and stucco work. By Air – The city’s airport is just 12 km close to Madurai. By Road – From Coimbatore, it takes seven hours drive and reach Madurai from Rameswaram involves four hour road journey. By Railways - Madurai Railway Junction is well connected with all Major cities in India. Climate of Mandawa – The dry climate of Madurai makes it a city fit for exploration from October to March. The tourist spot in India marking its land’s end, Kanyakumari is bestowed with seasoned surprises. Based along the famous beach, the site is known for its great tourist attractions. Vivekananda Rock Memorial, Kanniyakumari Amman Temple, Gandhi Memorial and illustrious Thiruvalluvar Statue are amongst its tourist attractions. The welcoming relief of Kodaikanal, a hill station on the wooded slopes 2,130 m above sea level is known for its picturesque setting, pleasant walks, waterfalls and a magnificent lake. The hill station is ideal for trekking and golfing on a beautiful 18-hole golf course. The sacred town of Rameshwaram, besides its no wave beach is famous for Ramanathaswami Temple, revered amongst Hindus as a major Char Dham Pilgrimage and a Jyotirlinga as well. 120 meter away from Madurai are Palani Hills, a famous pilgrimage center devoted to Lord Murugan perched atop a hill. Periyar Wildlife Sanctuary - Periyar National Park and Wildlife Sanctuary in Kerala is noted for its elephant and tiger reserves. The wild eco-region is also referred to by the name Thekkady forests, where many spices are extracted and cultivated. It is located 110 km west of Madurai. The sweet reminiscing beauty and misty aromatic wafts of Munnar make it a hill station bestowed with breathtaking beauty. Famous as South India’s Spa destination, Courtrallam in Tirunelveli district is a home to nine gushing and gurgling waterfalls. It is promoted as a health resort and also is known for its day treks and waterfall treks. Tiruchirappalli, fondly addressed as Trichy, is a historical city known for its two extraordinary temples, namely The Rockfort Temple and Sri Ranganathaswamy Temple. The Chola kingdom of Thanjavur rose to the glory for its famous world heritage site of Brihadeeswara Temple, the great Chola temple. This temple’s spire is carved out of a single monolithic granite rock, admired for its architectural and creative excellence. The French Riviera of the east, Pondicherry is a rocky beach territory known for its refined French culture and traditions. Tourists prefer to visit this region to experience peace and salvation at Auroville, the spiritual abode of St. Aurobindo and its auro beach. Velankanni town is known and worshipped among Roman Catholics for the Church dedicated to Our Lady of Good Health. It is believed that the lady performed three miracles, namely the apparition of Mary and Jesus to a sleeping shepherd boy, the curing of a lame buttermilk vendor, and the survival of Portuguese sailors assaulted by a violent sea storm.